The hotel scene is changing on Ibiza with smart, sleek design and a new level of facilities’ offerings. A new year and a wave of new hotels arrives on the White Isle, some with complete makeovers and an entirely new offering, some with major upgrades. Ibiza's hotel offering is changing with new smarter, sleeker accommodation offerings that offer exceptional service, varied and modern gastronomic offerings, a new take on entertainment and some bringing art and culture upfront. We've included a couple of hotels that were launched last year, as we think these need to be etched onto your imagination. For a full range of hotels island-wide, see Ibiza Spotlight's hotels' guide for everything from budget to high-end room options. For now, read on and picture yourselves in one of these new hotel wonders. For blow-out luxury, the 7 Pines hotel resort does really have it all. New last year, it's the last word in high-end luxury with excellent gastronomic offerings, swish bars and exceptional concierge services. If you want to splash out, a selection of suites comes with private pools or you could hire the 7 Pines yacht for the day. The breathtaking cliff top views, with the rock of Es Vedrà as you dine has to be a big, big plus to start your day. The spa and wellness centre offers treatments and massages, plus there's yoga and pilates, instructor-led high-intensity training or running and much more. Right next to the beach and with an important facelift, the new FERGUS Style Bahamas gains upgrades in major areas throughout the hotel, such as the many bars and restaurant offerings to bring it up to four-star hotel level. The main central pool is still there as are the many sunbeds in this village-like hotel complex. An activities programme, fun accessible items like boules (bowls) or darts and a great and helpful team will help make your stay here a great one. You can walk straight onto the beach, into central Playa d'en Bossa and onto a smattering of super-clubs at night with supreme ease. Inspired by Coco Chanel as well as Ibiza, the decor in the new Bless Hotel Ibiza lives and breathes pure sophistication, with the simple white of the island mixed with beautifully styled furniture and the signature pale pink of the fashionista. Think big sofas and eclecticism redolent of Coco's Paris atelier and you have a picture of this new exclusive Cala Nova hotel. There's a vermouth bar, two infinity pools, great gastronomy and a superb cultural offering including fashion shows (of course) as well as performances and visual art. It's the perfect choice for those hedonist sophisticates out there. The W chain of hotels has changed what people expect of a hotel. At the W Ibiza, iconic and super-stylish design is a given, so what else should you expect? A super-charged concierge service is just the start. Lounge lizards and adrenaline lovers alike will love the rooftop bar and the “WET decks”, one for adults and one with direct access to the beach, where you will also find the hotel's own chiringuito. Not forgetting the 400 square metres of spa and gym area to supercharge that detox, before you slip into something comfy to listen to the hotel's specially-curated playlist to energise you for the night. Yes please. Coming in July this year is the elegant adults' paradise that is the Amàre Beach Hotel that's right on the seafront with most of the rooms offering sea views. As well as elegant style, expect a raft of facilities aimed at stunning the senses. There's a big terrace area, with two pools and a rooftop bar with another pool and a bar and many “sophisticated” sunbeds, plus a beach club. The food offering is vast from healthy and local to Michelin-starred and there's a 24-hour gym, wellness offerings and activities from yoga to jet skiing. Plus entertainment with an arty touch and live DJ sets. We can't wait. 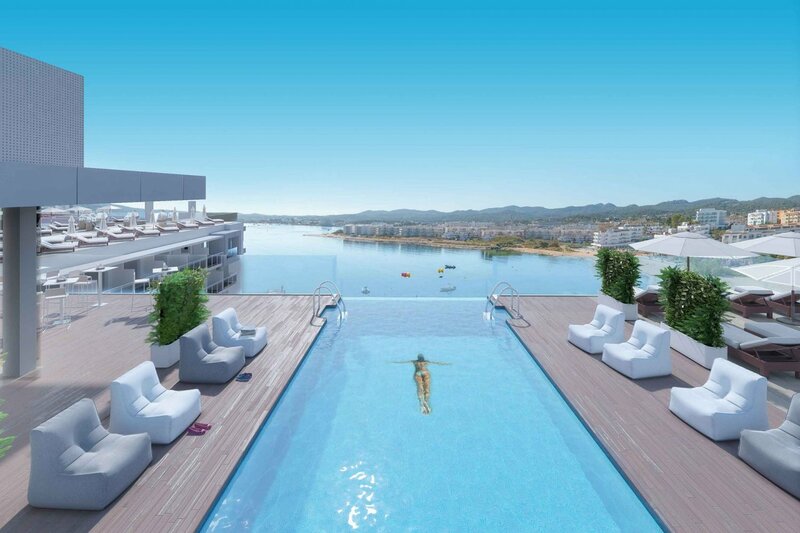 Right next to Ibiza's harbour area is the new four-star El Puerto Ibiza Hotel Spa that's getting ready to open for summer 2019. A transformation is underway to convert what were once holiday apartments into a sleek modern, yet conservative hotel. Extra space has been added, meaning bigger rooms and more of them plus lots of comfort touches. We're excited to see the “open sky” natural light feature, set to dramatically open up the interior space. With a spa, pool, gym, multiple restaurants and cafes as well as outside terraces, it's a classy joint. On the outskirts of this resort, near to the lovely Cala Gracio beach is the Little Havana influenced Art Deco wonder that is the Cubanito Ibiza Suites. Opening just last year, this adults-only hotel has had hearts aflutter with its cool retro room touches that transport you to ‘50s Cuba. A boogaloo soundtrack and Havana cigar menu adds to this cleverly. An excellent rooftop bar, an all-you-need concierge service, Latin DJs and salsa classes make this an indisputable gem of an escape.